Vacuums with HEPA filter can be a great aid if you suffer from dust allergies or asthma. We have researched several vacuums featuring HEPA filters in the UK and came up with a list of six top recommendations. So, if you are looking for a HEPA filter vacuum, but you do not know which one to choose. Or you want to know the best vacuums with HEPA (High efficiency particulate air) filter without spending much time and effort; you are on the right page. Once you read all the reviews and the buying guide we have included, you will make a well-informed buying decision. Why Use a HEPA Filtered Vacuum? How is a HEPA Vacuum Cleaner Beneficial for Allergy & Asthma Sufferers? How to Choose the Best HEPA Vacuum? Before we discuss the top six vacuums with HEPA filters, you should know what it does. HEPA filters trap both dust particles and microscopic including allergens, mould and never allow them to recirculate back to the air through the exhaust. Due to this feature, such filters have several benefits. Reduces Asthma outburst: HEPA filters remove the dust particles from the air including all kind of allergens, which protects users who have asthma or any other dust-related allergy. Reduces allergic reactions: Vacuum cleaners that includes HEPA filters are also known as allergy cleaners. Why? Because HEPA filters remove pollen, dust and all other allergens that can result in an allergic reaction. Make the air hygienic: The HEPA clears the air and gives you a fresh and clean environment to breathe. Even if you do not suffer from any allergic problems, you will like the clean atmosphere. You can get a cheap vacuum with a non-standard HEPA filter. Such low priced filters will not work up to the mark. So, we suggest you read all the reviews and then make the right decision. Well-built and sturdy, CX1 comes from one the best breed of vacuums. Aimed at your fur bodied friends, CX1 Cat & Dog is a perfect cleaner for houses where a pet also lives like a family member. It is the first bagless vacuum from Miele where they use a large bin, an innovative self-cleaning HEPA filter, high air-speed cyclone and advanced engineering that we always expect from the brand. The only component CX1 lacks a rotating brush to clean the pet hair, but its strong suction and other standard floor tools do the part to give you a clean, fur-free house. As you can guess with its name, it takes care of the pet hair very well. The vacuum comes with an advanced filter manufactured by Gore, which is an Allergy Foundation approved HEPA filter featuring a self-cleaning system. Automatically or by using Comfort Clean button, it rotates two small prongs inside the filter to dump all the dirt to the canister. Once collected into the dustbin, you have to empty the dust after every cleaning session to maintain the hygiene. CX1 offers four modes of cleaning controlled by a knop located on the top. You only have to change the cleaning power depending on the material you are trying to clean. Main power button can be easily used with your foot as well. At more than 6 kg and a big footprint, CX1 is made for heavy-duty cleaning. It is sturdy and substantial but hides all the heft behind four free wheels covered with soft rubber. These coasters allow it to glide with you on hard floors and follow on the carpets. The vacuum also comes with a Miele’s Cat & Dog floor head as an accessory. It is a rotating brush bar with two rows of stiff nylon bristles that takes care of all the carpet cleaning in your house. We were expecting this floor head on CX1 as Miele has made it a habit of including this tool on pet-centric cleaners. After seeing the tests of results of the vacuum, we can say that its HEPA filters remove all the allergens from surrounding air to give you a clean atmosphere to breathe. Flagship vacuum of Shark, NV601UKT comes with more features that we can count. This shark vacuum can be used both as an upright and a cylinder cleaner. Its lift out pod does that for you for quick cleaning of the areas under furniture, stairs and other compact spaces. NV601UKT comes with anti-allergen HEPA class filtration, so it gives you an allergen-free air to breathe, every time you use the vacuum. 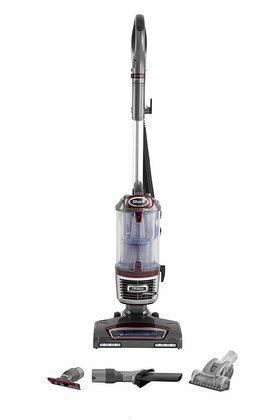 The HEPA upright vacuum comes in four parts, main lift-away motor and bin, floor-head with an electronic rotating brush, and wand, but in two pieces. Both the parts doubles as a handle while you use the cleaner an upright. The floor head has a flexible neck that gives you easy steering and rubber wheels to make it run on all kind of floors. It also has a set of LED lights that provide you illumination while cleaning the dark corners. You get an extended range of accessories including Shark’s high-end Dust Away hard-floor cleaning tool and a small turbo-brush to clean stubborn pet hair. For cleaning performance and included accessories, the vacuum got A grades at the tests we performed on it. We tested the NV601UKT on carpets, stairs, and many other materials and it was able to clean all kind of dust particles. The HEPA filters remove all the allergens, so it is medically better for users having allergies. Designed for users suffering from dust emerged allergies, C3 Total Solution vacuum has a specially designed floor head with n 11-stage filtration process, which picks up 99.999%, allergens, pollens and other dust particles from the air. It works for all the floor types, so whether you have a carpeted house, hardwood or mixed, you can consider C3 Total Solution. This 1200Wcleaner comes with a variety of accessories including Miele’s AirTeQ floorhead, an upholstery nozzle, crevice tool, dusting brush and a Turbobrush. Apart from useful attachments, the vacuum comes with self-sealing HyClean GN dust bags. So, you are ensured to be safe from any allergens that can be on the dust. The vacuum is easy to use, has convenient foot controls, and also telescopic tubes. Large wheels under the main body and its flexible tube make it very easy to manoeuvre, and its hard/carpet floor switch is located at both the sides. So, irrelevant of the fact that you are a left foot user or right, you will be able to use the power button conveniently. Sturdy telescopic steel tubes adjust easily at the touch of a button, and there is also a clip to hold the hose while cleaning or manoeuvres. C3 total solution is a great vacuum cleaner and is perfectly safe for all the individuals suffering from dust related allergies. It has strong suction, solid tubes, power control at the foot, AirTeq and Parquet floorheads for outstanding cleaning results. Endless features and versatility to work as an upright or cylinder cleaner give NV681UKT an effortless entry at number four. If you want a vacuum that can do all the cleaning tasks for you, this can be a good option. HEPA filtration is another attraction in this vacuum. It does well at removing all the allergens from the air so that you can live in a clean house. Open the box, and you will see its main body and an extended range of accessories. The central part is its Lift-Away section, which comprises the motor, bagless bin assembly and the filtration. With hose and any of the tools attached, it can work as an independent cleaner. Sculpted top of this section gives you a comfortable grip, and it has a flat base, so can stand on its own. There are no wheels, but at 3 kg you will not feel any stress while carrying the vacuum to the stairs. Its power cable has a length of 8 meters so that you will have a good reach around the vacuum and you will be able to continue the house cleaning without looking for an electric outlet. A quiet but powerful vacuum, NV681UKT gives you useful cleaning results. It can work as a full-fledged upright and also as a cylinder cleaner. Solid suction and ergonomic handle add to its value. Vonhaus is not as recognised as Shark or Dyson, but their stick vacuums are doing well in the market. Our seventh entry from this brand is a fundamental and affordable vacuum but is perfect at all cleaning jobs. The vacuum has a combination of HEPA filter and sponge that works in a better way than the former alone. The mixture is better at removing allergens, bacteria, mould, and dust particles from your house. It has a dust capacity of 1.3 litres, which is more than enough for your house cleaning sessions. It has two modes to choose, upright with the extension tube and another is handheld. The crevice tool included with the vacuum helps you to clean small corners, and hence you get a clean home. If you want an affordable and versatile cleaner, then this Vonhaus should be on your shopping list. Excellent filtration provided by the combination of HEPA filter and sponge is unmatched while the dual cleaning modes add to the value. A powerful upright, SEBO 91506GB works on all the surfaces and gives excellent results. It comes in a bagged design with a beneficial S-Class filter, that is why we have kept in our top recommendations for users having dust allergies. Working as a replacement for HEPA filter, S-Class filter also has a similar filtration and removes 99.9 per cent of allergens and other dust particles from the surrounding air. It can filter any particle that has a diameter 0.3 microns or bigger. However, there is a difference of 0.07 of performance efficiency between HEPA and S-Class filter, which is less likely to make any difference. So, we have included SEBO 91506GB in our list, being beneficial for asthmatic or people suffering from any other allergies. Powered by an 890W motor, the vacuum uses company’s “Computer Control System”, which allows the cleaning brushes to adjust height for optimised cleaning performance automatically. It also has a significant dust storage capacity of 5.3 litres, so you will not be wasting time in repeated bin emptying. Overall, the vacuum gives you some severe cleaning outcomes. SEBO 91506GB is a powerful and versatile cleaner made with high-quality materials. The price tag has high numbers, which is rightly compensated by its bagged design and S-class filters that makes the vacuum perfect for asthma and any other allergy sufferers. When you vacuum, it inhales the air through the powerhead and all the dust particles and debris is deposited into the dust collection bag or bin. The vacuum then exhales the air through a vent usually located at the back or underneath its central body. Without strong filtration, the bacteria, pollens and allergens will flow back and mix into the air. That is what happens when you use a vacuum without HEPA filters. On the other hand, if you are using a vacuum with HEPA filters, you are getting the same pure air that an air purifier can regulate. So, air coming out through a HEPA filter is a lot safer then what went inside. A vacuum with HEPA filtration is one of the best investment you can make. With the floor and materials of your house, the air will also be clean and safe for allergy and asthma sufferers. Apart from regular HEPA filters, there are other variants of vacuum cleaners that come with sealed HEPA filtration system. This mechanism works for those who need more than just HEPA. In a sealed HEPA filtration system, you are ensured that none of the air will escape from cracks and vents of the central body as the vacuum has an airtight construction. Vacuum with sealed filtration is tested that no wind releases back into the house from any other part apart from HEPA filters. There are many other filtration systems available in vacuum cleaners, and we have already mentioned the best of them. If you need a top quality vacuum that can keep the asthma or & allergies under control and at the same time offer unmatched performance and convenience, then you can select any one of the given six vacuums. You should make an informed decision before you choose a vacuum cleaner. Well, this is the reason why we have included this section here. You already know the features of different vacuums from the list above. Now, if you spent a moment reading the given points, you will be in a better state to choose a model that is friendly with users suffering from asthma or any other allergy. Bagged or Bagless. You can choose any of the vacuums among bagless or bagged vacuums, but it is necessary for you to make the right choice depending on your health. Bagged vacuums keep the dust and debris sealed in a tight bag, and hence they are comparatively better for individuals who have asthma or any other air born allergy. Filtration. One of the primary factors that you should check on a vacuum is its filtration process. S-Class and HEPA filters are the best as they eliminate allergens responsible for allergy or asthma flares. You can also look for a vacuum with sealed filtration, for optimum protection. Dual fan suction motor. A motor with a couple of fans can pull comparatively more dirt and allergens than a single fan motor. So, it will be better if you purchase a vacuum with dual fans for better use of HEPA filters resulting in a sanitary environment. Hygienic dust bags. If you opt for a bagged vacuum, look for one that comes with a flapped dust bag. So that it automatically closes to prevent any dust leakage while you change the bag. Pet-hair friendly. If you are a pet owner, then you should be aware of the severe reactions caused by the hair and dander left by them. We understand that you love your pets, but you cannot avoid your health at any cost. So, buying a vacuum that is an expert in pet hair cleaning will not only save you from a reaction but also give you a hair free and clean house. Weight. A general point, but one of the most critical factor to consider while purchasing a vacuum is its heft. If you want to do some quick cleanups and also looking to get rid of allergens, then you would not like to be lugging around with a massive cleaning machine. So, look for something easy to use and lightweight. 1. What does a HEPA vacuum do? A HEPA filter traps all the allergens in the cleaning process and gives you a clean breathing air. The air released by HEPA filters are free from any irritants and reacting agents so that you can reduce using pills or inhalers. 2. When should I change my HEPA filter? We do not have any thumb rule to replace a HEPA filter. Generally, they last for two years. However, if there is a musty smell in the surrounding environment after you vacuum, then you should understand that the HEPA filters are not more active and you should change them. 3. Do all vacuums have HEPA filters? No. HEPA filters are not a generic component of vacuums yet. Only those cleaners that mention in the reviews or specifications that it has a HEPA filter has it. 4. Does a HEPA filter remove mould? Yes. The HEPA filter removes mould, bacteria, dust particles and all the other allergens from the surrounding air so that you can live a healthy and medicine free life. 5. Can I wash the HEPA filters? Not all of them are washable. HEPA filters are built with a mesh of interlaced glass fibres that can be easily damaged. If the filter is not washable, washing it will allow all the particles to escape. So, you cannot clean them if it is not stated as washable. If you or someone else in your house or office has asthma or any other allergy, or you want to breathe in clean air, using a vacuum with filtration is essential. Most of the modern vacuums come with filters. However, HEPA filtration is the best as it is better in removing mould, bacteria and smaller dust particles. So, if you are facing ay trouble in finding the right vacuum with HEPA, you can easily choose any of the six mentioned cleaners.